All Scottish airports have been closed although search and rescue helicopters are still able to fly. Most flights in UK airspace have been suspended until 1900 BST on Friday and passengers were advised to check with their airlines before setting out. A spokesman for the National Air Traffic Service (Nats) said: "Flights in Northern Ireland and the Western Isles of Scotland to and from Glasgow and Prestwick may be allowed in the period from 0100 BST to 1300 BST subject to individual co-ordination. "North Atlantic traffic to and from Glasgow, Prestwick and Belfast may also be allowed in the period." A BAA spokeswoman said: "Following advice from the Met Office, the National Air Traffic Service has introduced restrictions to UK airspace this morning as a result of volcanic ash drifting across the United Kingdom from Iceland. The eruption under a glacier in Eyjafjallajoekull area is the second in Iceland in less than a month. Residents in Shetland and Aberdeen have reported smelling the effects of the ash, describing it as "sulphurous". The Met Office said "dust and smells" had been detected in the northern isles. Dust which has been collected at Lerwick, Shetland, is being analysed by the Scottish Environment Protection Agency. Philip Avery from the Met Office said: "Nats has good cause to be very cautious about this because in about 1982 a British Airways jumbo had the unnerving experience of having all four engines shut down as it flew through a plume of volcanic ash." Christine Campbell, 55, from Garelochhead, Argyll, who works at Faslane naval base, got to Glasgow Airport at 0530 BST for a flight at 0645 BST. She was travelling with her daughter to La Rochelle in France for her son's wedding. She said: "I'm really disappointed and upset because I've been looking forward to this wedding for two years and at the last minute there's this hiccup." She said she was planning to try to get a train to London and then travel to France by Eurostar. Another passenger said: "I'm meant to be going to Lanzarote. We've travelled from Oban, leaving at 3am. Now we've decided we might as well just go home and do a bit of gardening." Glasgow Airport managing director Amanda McMillan said the financial impact on the Scottish air industry could run into "hundreds of thousands" of pounds. The airport usually sees more than 15,000 passengers pass through on 200 flights a day. Ms McMillan added: "There are a lot of people here who have worked here for many years but this is not something that anyone at the airport has seen before." Glasgow Prestwick Airport in Ayrshire was also closed until further notice. Aberdeen Airport spokeswoman Sarah Campbell said there were more journalists and staff there than passengers. Aviation expert Jim Ferguson said: "Volcanic ash and aeroplanes do not mix. "There was at least one British Airways 747 that turned itself into the world's biggest glider when it picked up a lot of ash over Indonesia and Indonesia had not notified anyone of the problem. "The crew were able to eventually land the aircraft safely but there was an awful lot of people in the aviation industry thought they were headed for the water." A Nats spokesman said: "The Volcanic Ash Advisory Centre has issued a forecast that the ash cloud from the volcanic eruption in Iceland will track over Europe tonight. The Ministry of Defence said it was assessing what effect the dust will have on Exercise Joint Warrior - Europe's largest military training exercise which started on Monday. Large numbers of the Nato aircraft and crews taking part were flying from RAF stations at Kinloss and Lossiemouth. Elements of the training takes place around Cape Wrath in the north of Scotland. From Democracy Live: Emergency ministerial statement on the volcanic ash cloud. 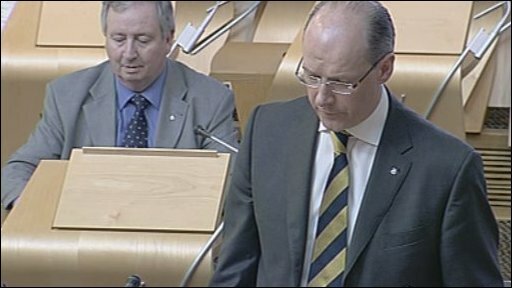 Finance Secretary John Swinney updated the Scottish Parliament on the situation in an emergency statement in the afternoon. He said: "The analysis that we have of emissions from volcanic eruptions is that the ash is not poisonous and has the potential only to irritate those who may suffer from skin conditions or asthmatic conditions." There had been no indication that ash should cause alarm to farmers, he added. Meanwhile, the disruption caused by the ash has caused a significant upturn in demand for rail services. ScotRail, which operates 95% of services within Scotland plus the overnight Caledonian Sleepers, said there had been a "surge in demand". A spokeswoman said: "Our telesales department, which also sells tickets for other train operators, has seen a near 300% increase in calls. "The surge in demand is mostly for travel today to England from people whose UK domestic flights have been cancelled and are switching to rail." She advised people not to turn up for any Caledonian Sleeper service without a valid reservation. Virgin Trains said it put on an extra service from Glasgow Central station to Birmingham New Street and London Euston at 2000 BST to help airline passengers. The volcanic eruption in Iceland on Wednesday night sent plumes of ash thousands of feet into the air. The cloud has spread across the UK to Europe. The spread of the ash cloud at 20-30,000ft raised concerns for air safety, forcing at least 12 countries to restrict or halt flights in their airspace. The eruptions from the Eyjafjallajoekull volcano continue to pump out ash clouds sporadically, which means the disruption is set to continue. Although the cloud is too high to pose a health risk, people with breathing problems have been advised to take extra care if it falls to ground level.